Novel Treasure is a published author who is an avid gardener and enjoys organic gardening techniques. According to an EPA study done in 2003, the United States generated more than 290 million scrap tires. Years ago these tires would just end up in landfills or ditches along country roads. With so many old tires filling up landfills all across the United States, many people are trying to come up with their own uses for their old tires rather than continue to perpetuate the ever growing landfill problem. There are many different cool ways to recycle tires. We chose to upcycle our old tractor tires and truck tires, by using them to create raised beds for our vegetable and fruit garden. We have two double tier raised garden tire planters and four single tier raised garden tire planters. Some people choose to make painted tire planters, which can be a colorful addition to any garden. We chose to keep ours with the basic black as we did not want to risk any of the chemicals from the paint leaching into our organic vegetable garden and potentially harming our food. And we use the tires for cooler season vegetables and the black tires help keep the soil warmer and extend the growing season. Many are concerned that the black tires will "fry" the plants during the heat of the summer months, but we have not yet experienced any kind of damage to our plants even in the 100 degree temperaturs of July and August. 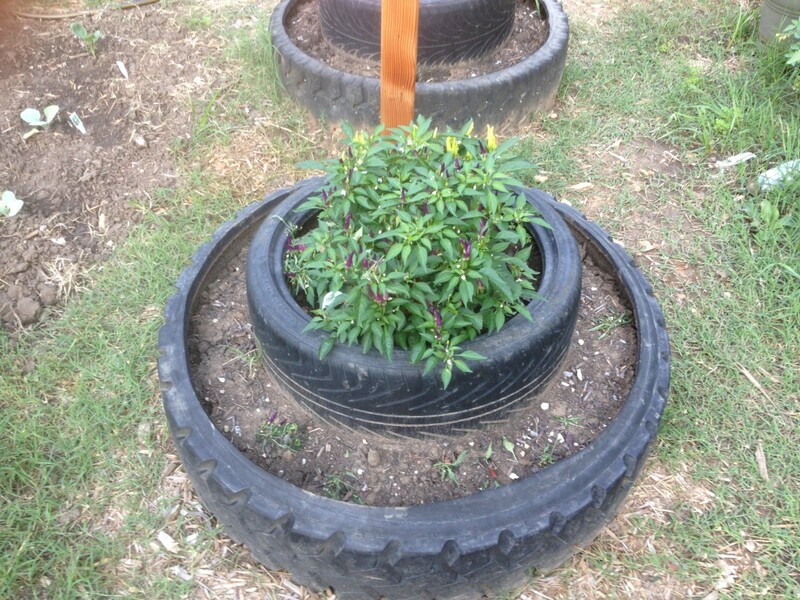 Making a used tire planter is actually quite simple. You can use most kinds of used tires for this purpose. You can usually get used tires for free from tire shops or repair shops as most of these businesses have to pay to dispose of the used tires. Most of them won't mind if you take a few off their hands. 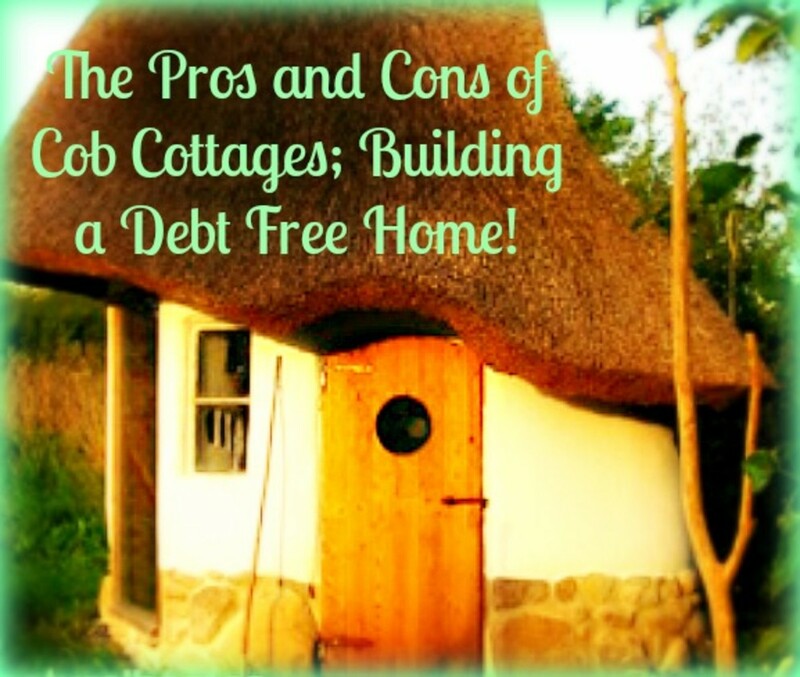 You can also find used tires at a junk yard but you may have to pay a small fee. First decide how many tiers you want the planter be. You can do a single layer or a double tier. I would not recommend going above a double tier for the single width tire planter, as then you have to worry about staking a third tier. If you want to go higher than a double tier tire planter, than you want to increase the width of the base by using multiple tires on the bottom for support. To create the double tier used tire planter you see pictured above. We used two different size tires. We used an old tractor tire and a regular truck tire. The larger tractor tire is used as the base because it is wider. For more planting room we recommend that you trim the tire wall first. To locate the best spot for trimming, find where the tire tread meets the tire wall and leave at least an inch of the tire wall. Be sure to make as smooth a cut as possible to avoid potential hazards with sharp edges. We used a sawsall to cut through the tire wall. Place the tires in your garden or yard, how you want them before you fill with dirt. As they are a pain to move once filled! Follow the same process with the smaller tire. Once you have trimmed one side of each tire, you are ready to place in your garden or yard. Place the larger tire on the bottom with the trimmed side facing up, and fill with nutrient rich gardening soil for best results. Place the smaller tire in the middle of the larger tire with the trimmed side facing up and fill with nutrient rich gardening soil. You are now ready to plant! With all raised garden beds, you need to make sure to water often, as raised beds drain faster than plants planted in the ground. Use mulch to help retain moisture and reduce the amount of watering needed. Instead of using old tires as planters on the ground, you can also hang them and use them as vertical garden pots. Try your hand at sculptint the tires into creative and artsy individual used tire pots. 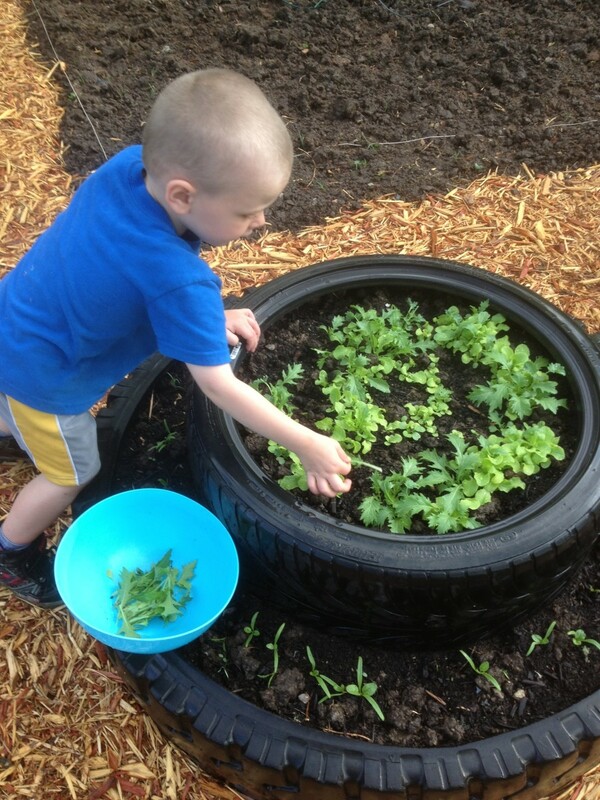 Use paint to create a one of a kind painted tire planter. Colors add fun and a bright spot to your garden or yard. To paint a used tire, make sure to clean the tires first with a degreaser, otherwise the paint will not adhere to the tire very well and is likely to come off more easily. One caution when using paint, make sure to use a non-toxic paint that won't leak any harmful chemicals into your soil and possible taint your flowers or your herbs, veggies, or fruits. Are used tire planters safe? 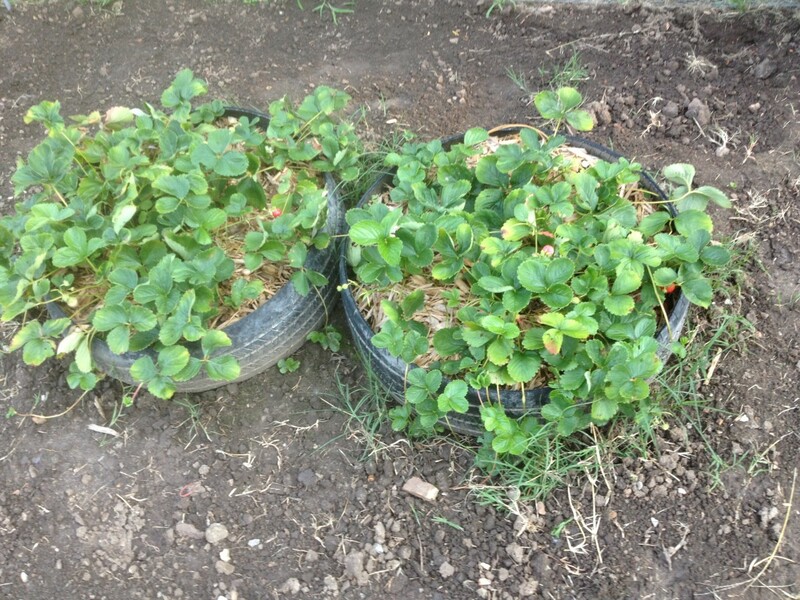 Many people have inquired as to whether or not used tires are safe for planting, especially when planting edibles. However, used tires will degrade as they get older and the longer they are outside exposed to the elements. With the degradation of of the tire, there is potential exposure to leached metals and PAHs (Polycyclic aromatic hydrocarbons). However, PAHs are also found in meats cooked at extremely high temperatures such as in grilling or barbecuing. 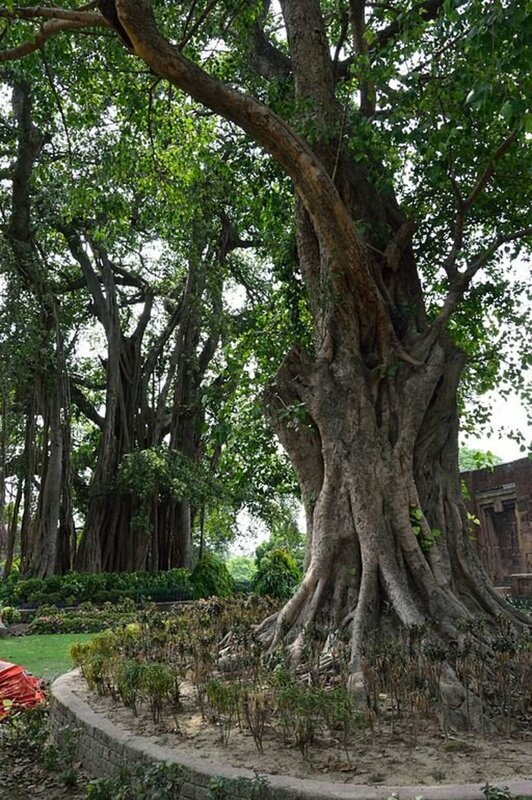 Although there has been much debate on the subject, conclusive testing has not yet been completed to determine how harmful, if any, used tires are in gardening and planting. What are some of the benefits of using used tires as planters? Here are just a few of the benefits of upcycling used tires in your gardens. Looking for upcycle projects or upcycling ideas. Uses for old ladders. Recycle old ladders. Learn how to make a garden trellis from an old ladder. Bottle caps must be separated from their bottles in the process of their recycling and are always thrown away as wastes. This hub gives some ideas how to upcycle bottle caps so that they become useful. Nice work! Great to see some homegrown green innovations! Growing lettuce and spinach old tires is a good idea as they will stay cleaner and have less weeds competing for soil nutrients. Another tier will contain potatoes with onions around the outside. I plan to do this as soon as I get the old tires. Thanks for the useful idea. That's a really great idea too! I will have to see what we have lying around the farm. This is a great way to recycle. I have friends back in Maine that used to do the same thing. Old pickup truck caps also make a wonderful roof for a makeshift greenhouse suspended on posts.